ULTRA STRONG COMPATIBILITY: This Gaming headset supports PS4, new Xbox One, PC, laptop, Nintendo switch, PSP, tablet, mobile phone, but you need a Microsoft Adapter (Not Included) to connect with Xbox One of old version. This PC headset is capable of various games. Killing zombies, destroying the boss, this headset is your BFF in game playing. ◕‿◕CRYSTAL-CLEAR SOUND: This PS4 Gaming Headphone has a crystal clear sound with minimal distortion. Built-in industry-leading high precision 50mm magnetic neodymium driver pursues a more immersive experience. ◕‿◕EXACT PICK-UP/VOLUME&MIC CONTROL: 360°adjustable microphone, can be adjusted at any angle for accurate pick-up. PS4 headset's microphone also with a sponge, which well captures the user's voice yet eliminates unwanted background noise. Microphone can be muted via one key attached to the cable.Both the gaming/chatting volume can be controlled from the in-line control box. 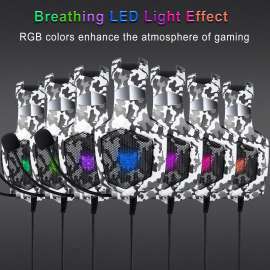 ◕‿◕SUPER COOL APPEARANCE: Breathing LED light effect with 7 automatically changing colors enhance the atmosphere of gaming. Unique eye-catching sharp appearance, full of game elements. 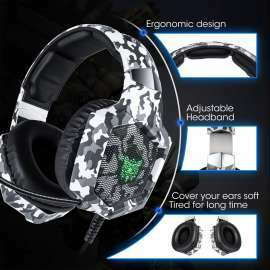 A high performance professional gaming headset with super cool appearance and light effect. ◕‿◕UNPARALLELED COMFORTABLE: Skin-friendly over-ear earpads and unique 3-pieces of padded headband guarantees hours of gaming comfort. The retractable headband design for flexibility and durability. Suitable for family and friends as a gift.As a company focusing on quality and service, we would like to provide a 12-month warranty to all our customers.